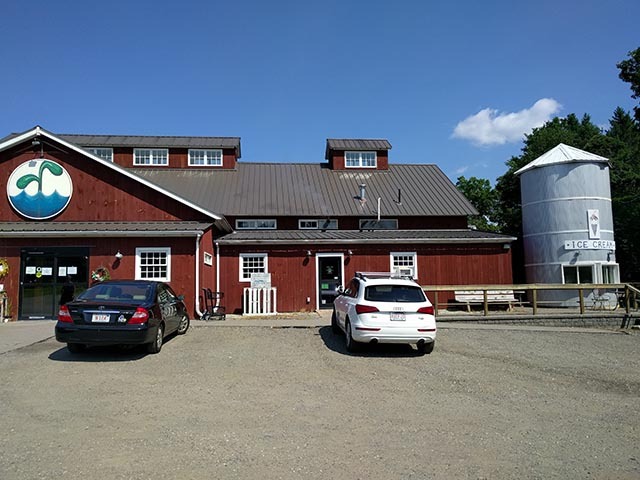 Sure, you can get fresh vegetables, fish, and meat, herbs and spices, deli sandwiches, and other catered delights at the Water Fresh Farm Marketplace, but what you really came for was the craft beer. If you were starting a microbrewery, you would be hard-pressed to build one in a better location (a farm with a market) and with easier branding (taken directly from the Boston Marathon). Start Line Brewing brews hyperlocal craft beers, using hydroponic hops, grown right on-site. The farm provides fresh hops to the brewery. Awesome. 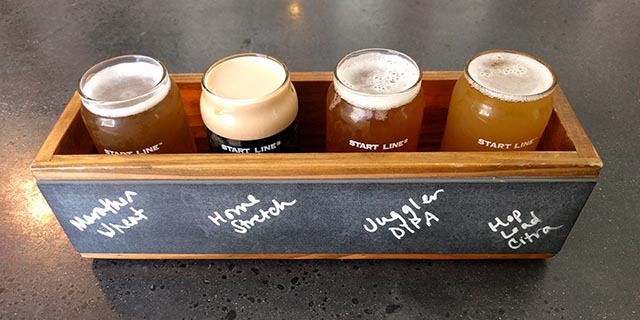 Where is Start Line Brewing located? Hopkinton, MA, about a mile and a half from the start of the Boston Marathon. Late 2016, with a grand opening in early 2017. If you visit the farm, you can learn more about the hydroponic hops that are being grown by Start Line and Water Fresh Farm. Better yet, the hops are free of pesticide. All the more reason to drink local! Absolutely. Families bring their kids for lunch often. Due to Start Line’s small taproom intimacy, I’d say it’s more kid friendly than Jack’s Abby over in Framingham, a few towns away. What types of beer does Start Line brew? Mostly IPAs (at least when I went). There were four of them on tap, the Hop Load, Hop Load Citra, Acrobat Double, and the Juggler Double. Also, Pale ales, Wheats, Reds, and Stouts. Does they serve other types of alcohol in the tap room? Not really sure. Saw a ton of pint glasses arranged, but didn’t ask if it was an official mug club. Flights. 32oz can growlers. 64oz growlers. Cans for sale. The Mountain Wheat, Home Stretch, Juggler DIPA, Hop Load Citra (in order). Tons. And, smart to do so, especially since they lean on the notoriety of the Boston Marathon in their name. Does Start Line serve food? Not directly. The marketplace at the Water Fresh Farm sells the food, from cheddar, ham and chive biscuits to fresh banana bread. You are welcome to bring it into the tap room and sit at the tables. Maybe? You will have to do your own research. Maybe that will change with the new Farm + Taproom renovations. Can I buy Start Line Brewing beers in stores? 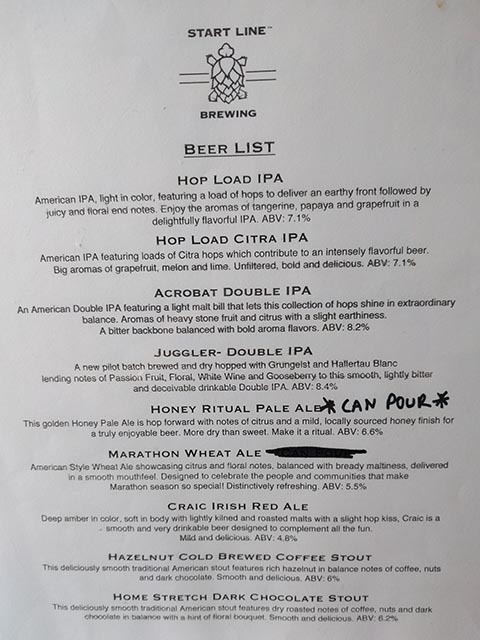 Here is a list of all the places that carry Start Line beer, if you are looking to find it. Tasty beers that are totally worth your time. Though I didn’t get any food from the marketplace, it looked really good. If you have kids, then Start Line is for you.